Gaming is now going beyond the ultrawide monitors and 50+ inch TV screens – gaming projectors are the new cool! And why not? Who won’t love playing Fortnite covered on a wall? It is completely lit and yet much more affordable than a TV of half the size of the wall. Now that you have also decided to buy a gaming projector, let me tell you a good gaming projector will cost you between 700 to 1000 bucks (or even more) and you can’t go wrong with this much budget at stake. So, I am here to help you make the right choice that you won’t regret! Actually, this holiday season, I thought of giving myself a gift 😉 – the Optoma GT1080Darbee which is the best gaming projector you can buy in 2019. Before making this choice, I did a lot of research and tested 10+ gaming projectors considering a lot of things including color accuracy, contrast ratio, input lag, throw range and resolution etc. I have explained all these in the detailed buying guide along with their effect on the quality of projection that you’ll get with your gaming projector. But before that, let me first show you what you are here for – the list of best gaming projectors in the market today! Here are the best projectors for gaming that are capable of playing games at 1080p to 4K resolution without any lag. Optoma did some solid work here with the Optoma GT1080Darbee which is engineered specifically for gamers. From throw ratio to rich contrast to 1080p resolution, every aspect is optimized to make sure your games look 100% awesome on this projector. Graphics are the core of gaming and Optoma knows it! The DarbeeVision processor on this gaming projector enhances the textures and depths of the game graphics for a perfect visual experience. I did not expect so excellent details and perfectly separating objects when I first used this. And, because of all that, first-person shooting (FPS) games like Fortnite look amazing with this projector while other alternatives fail to offer all those minute details! I am also impressed by its short throw ratio of just .49 which is perfect for gaming. This allows me to get a super fine 100-inch visual with the projector placed around 4 feet away on the TV stand. That too at a full HD 1080p resolution! Amazing, right? With 3,000 lumens of brightness and 28,000:1 contrast ratio makes it capable of rendering amazing black levels too. In fact, some horror games like Resident Evil get even scarier! Optoma GT1080Darbee also boasts of the top-notch response time of just 16ms; thanks to the Enhanced Gaming mode. So, no irritating lags at all – even most demanding games. Among other features, this gaming projector has full 3D support and the lamp has a remarkable life of up to 8000 hours. But the replacement lamp is quite expensive. Overall, the Optoma GT1080Darbee, though a bit expensive, is the overall best gaming projector for the money available in the market today. The BenQ HT2150ST is another great 1080p gaming projector having all you would need to have an amazing gaming session with your friends. This one is actually a strong competition to the Optoma GT080Darbee in terms of specifications and even outshines the latter in some features. For gaming, a short throw projector works the best and BenQ HT2150ST is a good choice for the same. Placed at just under 5 feet distance from the screen (or wall surface), this throws stunning 100-inch visual experience without compromising the quality at all. It also uses DLP technology to prevent any image decay due to age and continues delivering same high-quality image virtually throughout its life. Having 1080p full HD resolution combined with 2200 lumens of brightness and contrast ratio of 15000:1 offers a spectacular show on screen – be it gaming or videos. Sitting on my couch in a moderately lit room, I could see the darkest shadows as well as the brightest details pretty clearly. Though, I don’t recommend using this in a room with a lot of windows or bright lights. 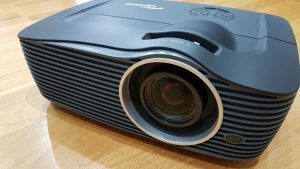 We all know that darker rooms are better for projectors to work great but in similar conditions, the Optoma GT1080Darbee performs better than this one. But when it comes to sound, this gaming projector has an impressive 20w speaker system that throws all its competitors out of the water! Customized Gaming modes allow low input lag (16.67ms) resulting in ultra-fluid gaming experience closely comparable to a TV screen itself. It also supports 3D, has 1.2x optical zoom lens and vertical image keystone that comes handy for optimizing image during initial installation. If you want a top-notch gaming projector that can also give you a large screen home theatre experience, then the Epson Powerlite Home Cinema 2040 is the right choice! It can deliver super fine visuals across 134 inches screen from 12 feet and 90 inches from 8 feet away which is ideal for larger rooms. With Epson’s 3LCD technology, you can practically forget about the rainbow effect or motion blur which generally occurs while playing action/high-speed games on a projector. The 2200 lumens brightness makes graphics vibrant and fine enhancing the overall gaming experience. To deliver the cinematic experience, the contrast ratio is pushed to 35000:1 which is best among all the projectors I have tested for this post. 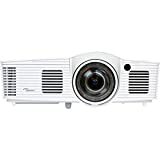 Connecting this projector with gaming console is also very easy because of the seamless connectivity options including 2 HDMI, composite, 1 audio stereo, VGA d-sub 15 pins, 1 USB type. To correct any vertical tilt of the projection, it comes with keystone correction but unfortunately, there is no shift lens. 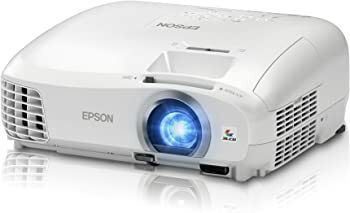 In my opinion, the Epson Powerlite Home Cinema 2040 is a great projector for gamers which can also be used for other home entertainment like movies and sports etc. Just like the one on the top of this list, the Optoma HD142X is also specially designed gaming projector from the house of Optoma. As we know, its hard to find a good gaming projector at an affordable price, but this projector fits perfectly in the budget. In fact, Optoma HD142X is the best gaming projector under 500 dollar price tag without compromising significantly on features. Despite the low price, this projector has got all you will need to experience life-sized gaming. It supports full HD 1080p resolution, capable of streaming 3D content; that too wirelessly. Optoma HD142X has brightness rating of 3000 lumens, the highest among all the gaming projectors on this list. Combine that with 23000:1 contrast ratio and you will get a bright and deep gaming graphics to enjoy! For connectivity, there are 2 HDMI 1.4a connectors, a 3.5mm audio jack, and a USB type-A port which are kinda limited but enough to connect Xbox, PS4 or PC for gaming. Where there are a lot of great features, there’s a couple of compromises too. The throw distance is longer than you may expect. Placed at a distance of 8 feet, this projector only covers 66 inches screen and to expand 107 inches, I had to place it almost 12 feet away. Also, the input lag is 33ms which can be considered just average for gaming. If you are planning to use it in a small living room, this may not be the ideal choice. Otherwise, if space is not your problem, then Optoma HD142X is the best budget gaming projector you can buy in 2019. The Epson 5040UBe is one of the most advanced gaming projectors in the market today and comes at a hefty price tag attached to it. This gaming projector will cost you more than 2000 dollars. I know most you are shocked but that’s true. It has to be expensive because of its plethora of high-end features including 4K UHD support! Imagine gaming in 4K resolution at larger than life screen – it’s incredible to witness that. In fact, it can also upscale non-4K visuals and deliver images in a resolution higher than Full HD. Also, the 3LCD technology removes any rainbow effect from the graphics as well. I was surprised to see the output quality of this gaming projector. The difference is significantly visible, thanks to the ultra-black contrast ratio of 1,000,000:1 for full-color detailed scenes – both bright and dark! The 2000 lumens brightness (white & color) rating takes the visual quality to an even better level. The Epson 5040UBe gaming projector also supports 100% true 3D with Rec 709 and LAB Ultra Wide DCI-P3 color gamut. It also supports Wireless HD streaming so you can forget about all the cluttered cables and give you gaming setup a much cleaner look. If you can afford this, there is no reason to ignore the EPSON 5040UBe – essentially the most advanced gaming projector money can buy! 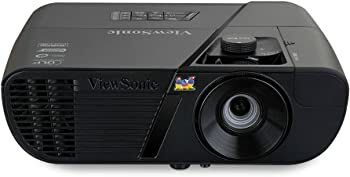 ViewSonic PRO7827HD Rec.709 is a revised version of the company’s regular PRO7827HD projector model, and it brings a number of visual and practical changes and improvements. The most obvious change is the transition from a white to a black exterior, although the design remains largely identical. However, the changes are more noticeable in terms of performance. This projector natively supports a Full HD 1080p resolution, but a more important factor is Rec. 709 – the international color standard which the projector fully meets, allowing it to produce vibrant and lifelike colors. It also delivers great contrast and its 2200 lumens brightness rating will be more than enough for average-lit rooms. The PRO7827HD is quite versatile when it comes to the connection options that it has available. First of all, it has 3 HDMI ports, two of which are MHL-enabled. Next, it has VGA, S-Video, Component and Composite inputs (one of each). And lastly, it has one 3.5mm audio jack, one 3.5mm microphone jack, as well as a USB type A and Mini USB port. As for outputs, it boasts one VGA and one 3.5mm audio out. Can I Play Xbox/PS4 on a projector? It is quite easy to connect your Xbox or PS4 console with a gaming projector. All you need to know a little tech stuff. Let me explain that to you. So, a little workaround is required. You have to split the audio and video from the HDMI port and use a separate soundbar or amplified speakers for sound. Here’s the complete process for the same. To play your favorite Xbox / PS4 titles on a projector, you will need the following. Plug-in the singular end of the HDMI splitter cable into the HDMI-out port on the back side of your gaming console. Now plug an HDMI cable in the video output end of the splitter and connect it to the HDMI-in port of your gaming projector. This will successfully deliver the video from your console to the projector. Next, plug the RCA cable in the audio output (L/R) of the splitter and connect it to the HDMI port on your speaker system or sound bar to enjoy high-quality in-game audio. An HDMI splitter is a pretty common accessory that I got for myself for just around 20 bucks and that’s not hard to spend for the work it does! As I mentioned at the beginning of this post, a gaming projector costs enough to get you concerned about making a wrong choice and regretting it later. So, here are some very important things that you must consider before spending some 800 bucks on a gaming projector. Read carefully! The first and foremost thing to look for in a gaming projector is its Resolution. I am sure you know that the 4K trend is already picking up the pace. And, according to me, 4K will dominate the resolution game in less than 5 years from now. Just like the 1080p Full HD is everywhere – be it monitors, TVs and even projectors. It will be a silly mistake to buy gaming projector having resolution lesser than 1080p. Though most games need very capable hardware to run in 1080p resolution, its the current standard for graphics and 4K gaming is not very far. The response time (or the input lag) is basically the delay that occurs to translate the motion on the projector screen. Any projector’s response time actually defines how quickly it can deliver the changing frames without the motion blurring. Most projectors have a response time of more than 15ms and it can touch even 40ms. The more the response time, there will be more graphic breaking and motion blur on the screen. Not every manufacturer is open about this detail except those who are branding themselves as “gaming projectors”. Technically, a 20-30ms of response time is not even noticeable if you have been playing games on normal monitors or TVs. Unless you have played on games on a gaming monitor with 1ms response time, a projector with 16ms response time will work for you. Projectors are criticized for being unsuitable to be used in day time. It depends on the brightness rating which defines the ability of the projector to work fine in daylight or a brightly lit room. As far I have tested these gaming projectors, anything above 2000 lumens is bright enough to give great picture quality in a moderately lit room. And, projectors with more than 3000 lumens are capable of playing even in a brightly lit room as well. One very important thing to notice before choosing a gaming projector is its Throw range. It is basically the distance from which the projector is able to deliver a projection of 100 inches in size diagonally. Projectors can be categorized into three major categories – long throw, short throw, and ultra-short throw. Long throw projectors are generally meant for outdoor activities. For gaming or home entertainment, short throw and ultra-short throw projectors work the best! Generally, most projectors deliver a 100″ size screen from a distance of 8-12 feet, but, not everyone has gaming rooms that large. Projectors like Optoma GT1080Darbee are able to throw a 100″ visual from a distance of just 4 feet which is ideal for gaming even in small rooms. Another complaint that users have with projectors is the lower contrast than a flat panel screen. The contrast ratio actually means how “deep” the black appears in comparison with the white. To get enough depth and brightness, the contrast ratio has to be more than 10,000:1. This means the black would appear 10000 times darker than the bright details. As far as game graphics are concerned, most projectors with 20,000:1 would work just fine. While for 4K gaming, you can projectors with contrast ratio as high as 1,000,000:1. It becomes necessary for a gaming projector to have enough connectivity options so that you can hook it up with as many types of gaming consoles as well as PC. At least 2 HDMI ports, one composite, one audio stereo, one VGA d-sub 15 pins, and a USB type port must be there in a good gaming projector. With all these ports, one can easily connect Xbox One, PS4 Pro, PC and even Nintendo Switch. Verdict: What Projector is Best for Gaming? Well, that brings us to the wrap of this roundup of best gaming projectors of 2019. I tried my best to deliver everything that you need to know about gaming projectors. I am sure you have made your choice by now, if not, here are final recommendations. The Optoma GT1080Darbee is the best projector for gaming while Optoma HD142X is the best budget option. If money is no object for you, then go for the Epson 5040BUe which is capable of handling 4K content as well. Do you have any questions about gaming projectors? Drop them in the comments section below. Also, if you any suggestions, feel free to share them with me. Don’t forget to share this post with your gamer friends. If you found this helpful, please give your rating below.